Shout-out to serious gamers: the Acer Predator Triton 500 PT515-51-71VV is speaking to you. 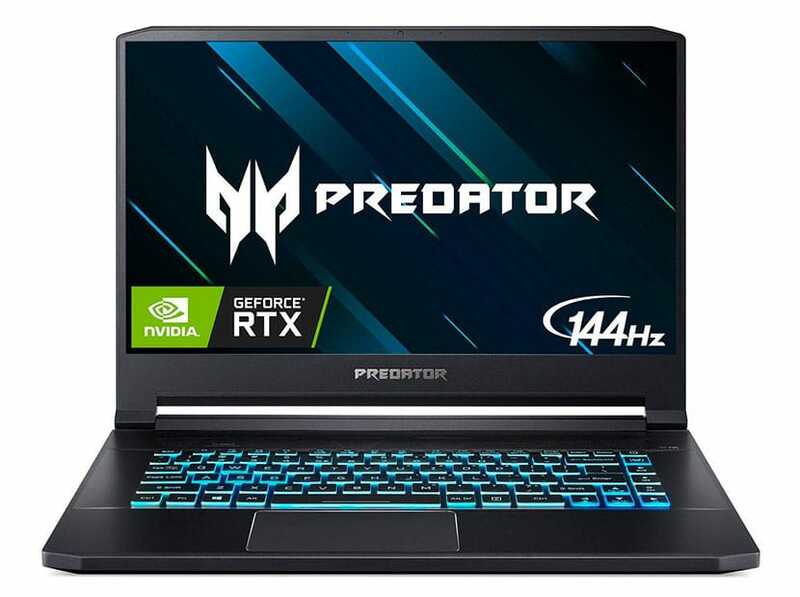 A 15.6” gaming laptop powered by an Intel Core i7 processor and the latest NVIDIA GeForce RTX 2060 graphics, this newest addition to the Predator series promises fluid and gratifying gameplay. Over time, Acer seems to have mastered the art of delighting passionate gamers with devices that value the glory of the game as much as they do. At first sight, the most recent Acer Predator Triton seems to uphold this legacy brilliantly. Let us delve in and explore the offerings of this gaming laptop, priced at a steep under $2000. It’s time to find out just how well it caters to the requirements of the gaming biosphere. Driving this laptop is an Intel Core i7 CPU (up to 4.1GHz), 16GB RAM, and a 512GB SSD. This is a stupendous combination, especially when you also reckon for the superior heat dissipation mechanism. This computer utilizes three AeroBlade 3D fans and five heat pipes (copper) to ensure minimal heat build-up and hours of smooth operation even at the highest settings. An 84Wh Lithium-ion battery (4-cell) provides a surprisingly long battery backup for such a powerful machine—up to eight hours. 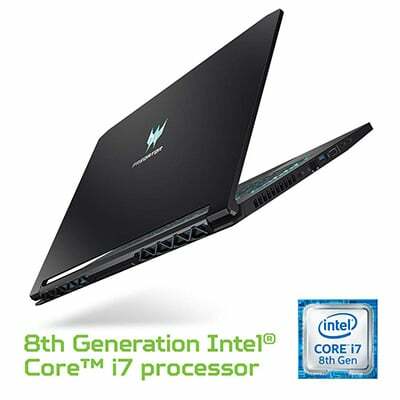 If you are planning to run the latest AAA titles on your laptop and covet efficient performance (read speed, quick boot-up, and ample storage space for heavy gaming files), this laptop should not disappoint you. Bonus: The PredatorSense permits you to customize your gaming just how you like it. It turns out to be straightforward to fine-tune the overclocking, lighting, fan speed, and game profiles. That is quite a handy benefit for players who wish to own every game they play and maximize the hardware/software to accomplish this. Guaranteeing seamless imagery even at high frame-rates is the NVIDIA GeForce RTX 2060 graphics processor with 6GB of dedicated memory. The new line-up of RTX GPUs, built according to the Turing architecture, stands out for never-seen-before features like real-time ray tracing and images enhanced by artificial intelligence. The former is especially charming: it ensures that in-game light imitates light in real life, thereby making any special effects, shadows, etc., in your game a great deal more realistic. 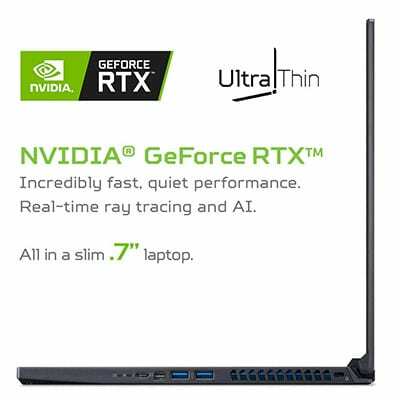 Here’s another inherent perk of investing in an RTX laptop: it is a future-forward decision. Many popular games like Atomic Heart and Battlefield V have announced RTX-special upgrades. Call it the fear of missing out, but really, would you want to forego something like that? Fortunately, the display on this laptop matches up to the brilliance of the GPU. The FHD screen has an aspect ratio of 16:9 and an IPS panel to ensure you can view it comfortably irrespective of your position. It also boasts of a swift response time of 3ms and a refresh rate of 144Hz. This combination is optimum for most present-day games. 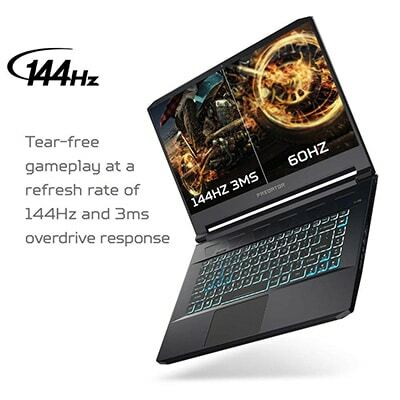 While you might save some dollars with a 60Hz/120Hz gaming laptop, the recommended metric for smooth gaming and reduced stuttering is 144Hz. Note that the monitor offers a brightness of 300 nits and a color gamut of 72% NTSC. A special word on the acoustics: delightful! The auditory system comprises two stereo speakers and a subwoofer for clear output. Acer has also used Waves MAXXAudio technology (Maxx Bass, Maxx Volume and Maxx Dialog) in conjunction with Acer True Harmony and Acer Purified to deliver captivating sound. This makes a marvelous difference to the final audio quality. This frost-forged gaming laptop looks every bit as potent as it is inside. A stylish black chassis and an astonishingly thin profile of only 0.7” give it a mighty but refined appearance. On the flip side though, this machine is quite a heavyweight at 10.9lbs. The weight limits its portability from one gaming marathon to the other, but you should not face any hassle if you primarily intend to play from your cocoon at home. 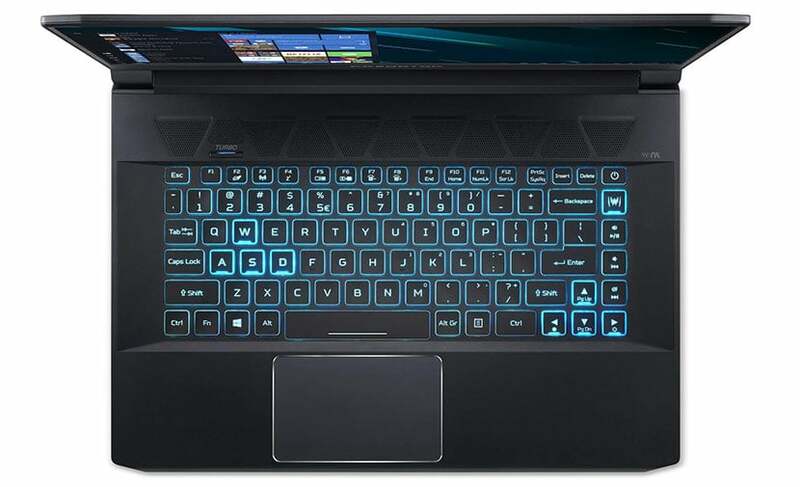 The overall accessibility features of this device are congenial to unending gaming sessions, particularly the mechanical RGB keyboard with its enhanced responsiveness. There is an entire spectrum of colors to explore—perfect to complement any game you choose to play. This computer is fitted with abundant USB ports to let you connect to gaming paraphernalia like mice, controllers, and external displays. You get one Thunderbolt 3 port (Type C), three USB 3.1 ports, an HDMI port, and a display port. An HD Webcam with High Dynamic Range (1280 x 720) lets you interact with your gaming comrades via high-quality video. Also, since this is a VR-ready machine, you can easily plug in a VR headset and enjoy far-off worlds from your cozy armchair in the living room. The internet provisions are adequate: 802.11ac Wi-Fi (2×2 MU-MIMO) and Killer Ethernet E3000 10/100/1000 (up to 2. 5 Gbps). To its merit, the new Predator also offers Killer DoubleShot Pro. This is a smart feature that makes bandwidth prioritization possible; it is as good as carefully handpicking the applications that deserve to use your bandwidth. Online gamers and lovers of competitive events in the virtual space can derive the greatest benefit from this. 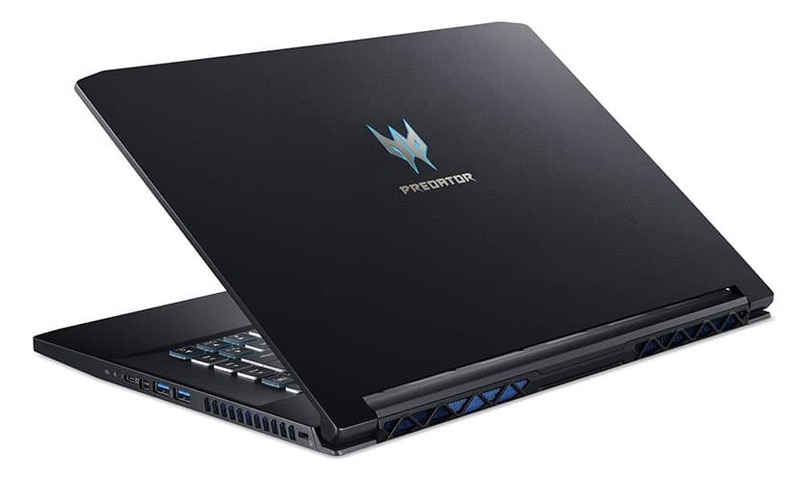 All things considered, the Acer Predator Triton 500 PT515-51-71VV makes its mark as a strong contender for an all-purpose gaming laptop. It delivers on scintillating speeds as well as glamorous displays, adding to the proceedings a welcome dash of immersive audio, USB connections, and a sustainable cooling system. It also brings to the table a clear understanding of network prioritization—a must for contemporary gamers who rely extensively on bandwidth. Acer’s newest offering remains low on mobility with its somewhat bulky build. But, considering the power it houses within, we daresay that is only a minor hiccup. If you are a serious gamer—and we mean professional-grade or someone with gameplay in their veins—this laptop could be your soulmate.